The Forest Stewardship Council (FSC) is an institution that deals with the protection of forest cover with the aim of ensuring that there is sustainable use. The organisation achieves this by setting standards that promote the satisfaction of various economic, social and environmental needs of a community while at the same time securing resources for the future generations. It applies principles of traceability to ensure that trading activities involving wood products are derived from certified forests. FSC certification is a recognition from the FSC body indicating that the products that a wood company deals with have met the traceability and sustainable use principles. FSC certification can either be the Chain of Custody Certification or the Forest Management Certification. Chain of Custody Certification is meant for enterprises that deal with the production and trade of forest products whereas the Forest Management Certification is a certificate for managers and forest owners. The Forest Management Certification is achieved when managers safeguard areas of high conservation value. Additionally, certification requires that managers address all non-conformities that had been noted during pre-assessment by a third-party certification body. The Chain of Custody Certification (COC) requires that one’s gross annual sales of wood products be less than five million dollars. Additionally, for an enterprise to be Chain of Custody Certified they should meet the requirements as outlined in the Chain of Custody Standard FSC-STD-40-004. Click on the image below to view our FSC Certificate. We are an enterprise that respects the principles of sustainability to secure forest resources for future generations. We hold an FSC certificate, and we specifically hold the Chain of Custody Certification. Additionally, we have been assessed against several standards such as Standard for COC Certification and the Standard for Company Evaluation of FSC Controlled Wood. 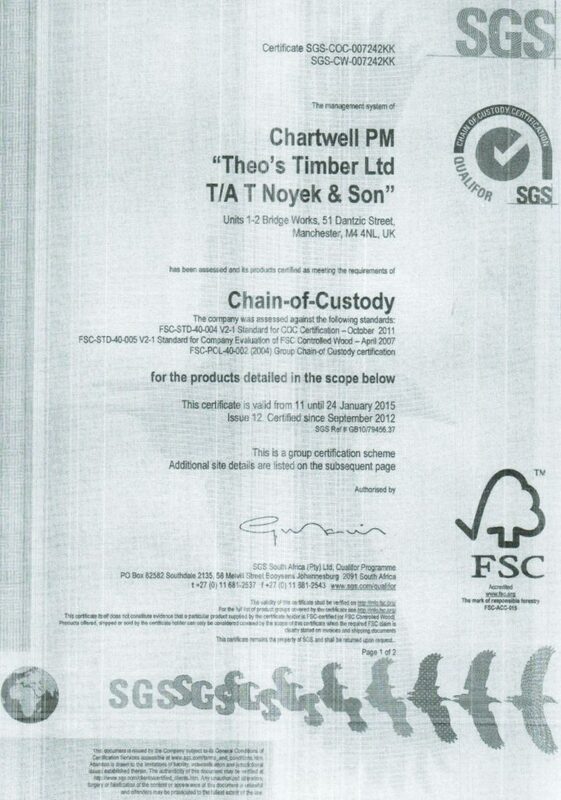 The fact that Theo’s Timber Ltd hold an FSC certificate guarantees our customers that all our products are legit and the means of producing the products are environmentally friendly. More importantly, being certified shows our commitment to protecting the environment as required by the law. Our products are eco-friendly since they have been responsibly sourced and produced. We are a law-abiding enterprise that is environmentally conscious. We are driven by principles of traceability rather than greed to make profits at the expense of ruining resources for future generations. Our products are of high quality, and the certification is a mark of quality assurance. Come shop with us and enjoy our premium products.